Here's another recent re-release; a re-discovered classic, if you will. Penguin does it once again, with their trademark eye for style. They are calling this collection of 6 titles Great Books for Boys, but I'm certain they wouldn't dream of excluding girls from enjoying them. 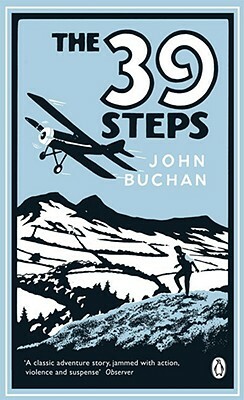 Greg read and enjoyed John Buchan's, The 39 Steps, here are some of his thoughts, including some movie adaptation advice, and some interesting Canadian history. Richard Hannay, retired mining engineer, newly returned from Namibia (where he has mostly been since the age of six), is really too young not to have anything to do besides read the papers at his club and spend all nights at frivolous entertainments. He really needs to have the police and a nefarious cabal (who for reasons of their own would like to see a war between the European powers) chasing him over the moors, glens, bens and burns of Scotland, with the fate of the entire British Empire dependent on his not getting caught. Notes of Stevenson, Kipling, Conrad, with overtones of the muscular Christianity of Tom Brown’s Schooldays. The 1935 Hitchcock adaptation famously has Hannay negotiate the aforementioned moors and glens handcuffed to an indignant and uncooperative but beautiful young lady. I don’t know why John Buchan didn’t think of that. Hannay in Hitchcock’s film is a Canadian, probably a nod to the fact that Buchan had just been appointed Governor-General of Canada. All the Canadian streets and parks named Tweedsmuir are named after him (King George V had just made him a Peer of the Realm as well, dubbing him Baron Tweedsmuir). The 2008 BBC film with Rupert Penry-Jones is pretty good, too, closer to the book but with significant nods to the Hitchcock version.